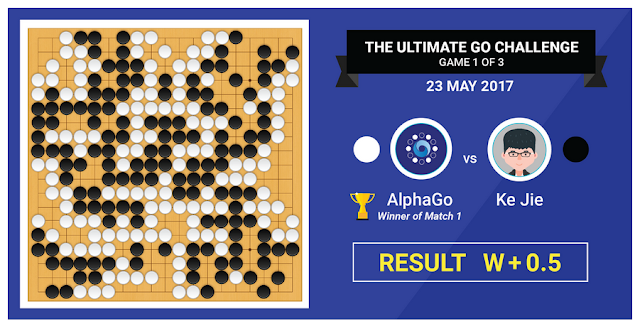 In the first game of the weeklong Future of Go Summit, DeepMind’s Go-playing artificial intelligence, AlphaGo, defeated the world’s number-one player Ke Jie by a half-point. The game, sponsored by Google and co-hosted by the China Go Association and the Zhejiang Provincial Government, is one of five scheduled, three of which feature Ke Jie playing against AlphaGo. The 19 year-old Ke Jie currently ranks as the world number-one Go player. He first studied the game at the age of five, becoming a professional player at the age of 10. The four-time international title winner opened the game with a 3-3 corner enclosure, introduced to opening theory by the legendary players Go Seigen and Kitani Minoru in the 1930s. Although the move was highly popular for decades, it fell out of favor in contemporary Go. However, following AlphaGo’s adoption of the move in a series of games in January, Ke Jie and other players have revived it in recent games. After AlphaGo responded by securing its own corner with its favored two-space high extension, Ke Jie leapt into the upper-left corner with a 3-3 invasion. DeepMind, founded in 2010 by Demis Hassabis, Shane Legg, and Mustafa Suleyman, revealed today that AlphaGo now runs in the cloud on a single tensor processing unit (TPU) machine, using the same version of the chip announced at Google’s developer conference I/O last week. TPU machines are processing units built specifically from the ground-up for machine learning. The current version uses 10-times less computing power compared to the AlphaGo match against Korean Go champion Lee Sedol in March 2016. The London-based company was acquired by Google in 2014 and is now part of the Alphabet group. DeepMind’s mission is to solve intelligence and use it to make the world a better place.